THE die slot must be empty and available according to the number of players (see Setup card). THE die you place must have the value that is indicated on the slot. When you place a die in a Guild, you immediately activate certain Workshops that have been built in the Guild (if there are any). You may choose to receive the benefit shown on the Building tile. 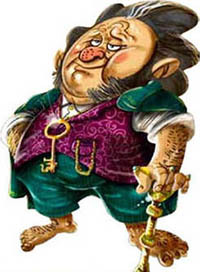 Example: Will has 2 Apprentices in the Artists Guild. If he places a die with value 3, he can buy up to 2 Goods and receive 2 extra Goods for free (1 for each Apprentice) for a total of 4 Artwork Goods. The Workshops activate from left to right. If you place a die with value 1 or 2, you activate the first Workshop on the left. If you place a die with value 3 or 4, you activate the first and second Workshop from the left. If you place a die with value 5 or 6, you activate all three Workshops. When a Workshop is activated, the owner of the Workshop receives the reward shown on the board above the Workshop. If a player activates their own Workshop, they do not receive the ownership reward. In a 2-player game the owner receives x2 the reward. After activating Workshops, you may end your turn OR perform one or both of these actions in the following order:. Buy Goods and Place Workers. After activating Workshops, you may end your turn OR perform one or both of these actions in the following order: Buy Goods and Place Workers. Each Good costs 1 Coin. The number of Goods you can buy is shown on the die slots: 1, 2, or 3. The supply of Goods is not limited. Use the multiplier tokens to represent a larger number of Goods. 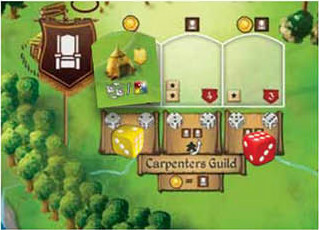 Some of the die slots allow you to place your Workers (meeples) as Apprentices in the Guild. You can use a Worker from your Workers Lot or transfer one of your Apprentices from another Guild. You can place a Worker only on an empty Apprentice slot. The number of available Apprentice slots in a Guild is equal to the number of players in the game. For example, in a 2-player game there are only 2 Apprentice slots available. When you buy Goods from a Guild, you receive one extra Good of that type for free for every Apprentice you have in that Guild. If you don't buy Goods, you don't receive extra Goods from your Apprentices. Only when you have an Apprentice in a Guild can you buy a Workshop for that Guild from the Guild Hall. At the end of the round, each of your Apprentices earns Coins. The amount of Coins is determined by the total number of Apprentices in the Guild (yours and other players').